Camp e Khas is Located at Sam, 45 Kms from Jaisalmer (known as sand dunes of Thar Desert). Camp e Khas is one of the best camping sights of Thar Desert- Jaisalmer. 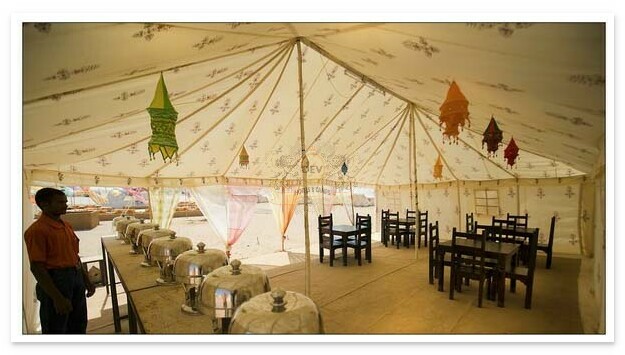 Tents are well furnished with modern amenities and traditional interiors. The tents are exclusively designed to provide visitors experience of lifetime. Experience the soul of this enchanting land on a camel safari's and Jeep safari's in Jaisalmer. We are inviting in magic of the Great Thar Desert Sam (Jaisalmer) the Dry Paradise in Rajasthan. We also provide village safari our guest request through jeep & camel in desert Jaisalmer and to feel local village lifestyle and atmosphere, an also seen Desert National Park to know about Desert wild life and clean dunes made by nature. Doctor on Call, Room Service, Laundry Facilities, Airport Transportation, Travel Counter, Breakfast Services, Backup Generator, Security Guard, Parking, Currency Exchange. Cable/Satellite TV, , DVD Player, Air Conditioning Room, H/C Water, Iron/Ironing Board, House Keeping, Toothbrush/Razor on , Attached Bathroom. User reviews for "Camp E Khas Hotel Jaisalmer"